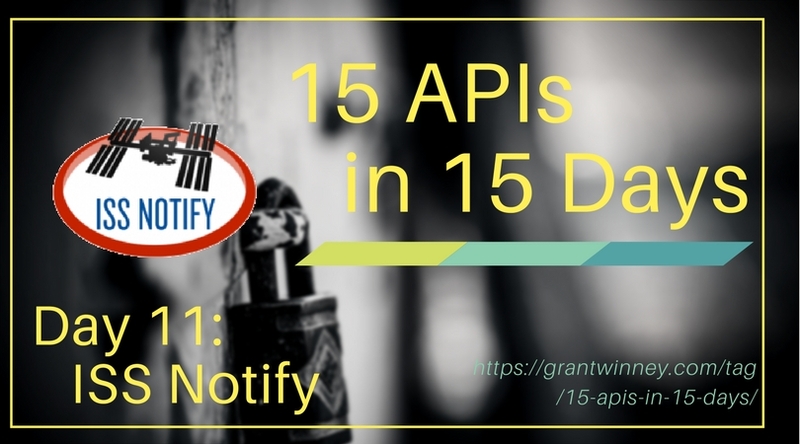 Continuing my search for 15 APIs in 15 Days (also on GitHub), today I'm writing about the ISS Notify API (or is it the Open Notify API?). Over the past 10 days, I've written about some APIs from corporations, and others from government agencies, but this one is smaller. The author, Nathan Bergey, wrote it for a competition called Science Hack Day - you can read more here. This is great. Could there be an easier way to find the location of the ISS? If you'd like to try it out in a script, here it is in Python2... but you can use it with any language you'd like as long as you know how to parse the JSON response. When is the ISS overhead? The other day, I used the Google Maps API to get the location of the Terminal Tower in Cleveland - the lat/long is 41.4984174, -81.6937287 respectively. We can use another endpoint to calculate when the ISS will fly over the Terminal Tower (or any other location of your choice). He also threw in an endpoint for getting the names of astronauts currently in space, but his docs say he has to manually update it, so it may not always up-to-date... although it currently is (expedition 54). This is a clean API, and really awesome if you want to find and easily consume the location of the ISS for your own purpose, or display a list of upcoming passes on a website or something. It looks like he opensourced everything too, so if you want to investigate how he did what he did, check out Open Notify on GitHub. I haven't dug into it yet - I'm not sure if he's collecting raw data periodically, or making calculations and caching the result, or just hitting some other API at NASA and passing the results along. It's cool of him to put in the work and make it publicly accessible though.